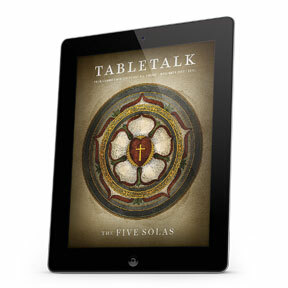 Earlier this week we announced the availability of the new digital edition of Tabletalk magazine for iPad™ users. We are pleased to be able to offer this benefit to subscribers who enjoy the convenience that comes with the digital format. But whether you currently subscribe to the print edition of Tabletalk or not, we’ve made November’s digital issue free for everyone so as many people as possible can try our new app and experience this unique publication. We encourage you to take us up on this offer and download November’s Tabletalk issue for free. In addition to articles that examine the five solas of the Protestant Reformation, R.C. Sproul teaches us how to apply the Proverbs, John Piper writes about the “blazing” glory of God, and Bob Kauflin explains why we should think twice before “cutting out on” Sunday worship. If you’ve never read Tabletalk, we’re certain you’ll soon discover why it has become a touchstone for biblical living for thousands of Christians.